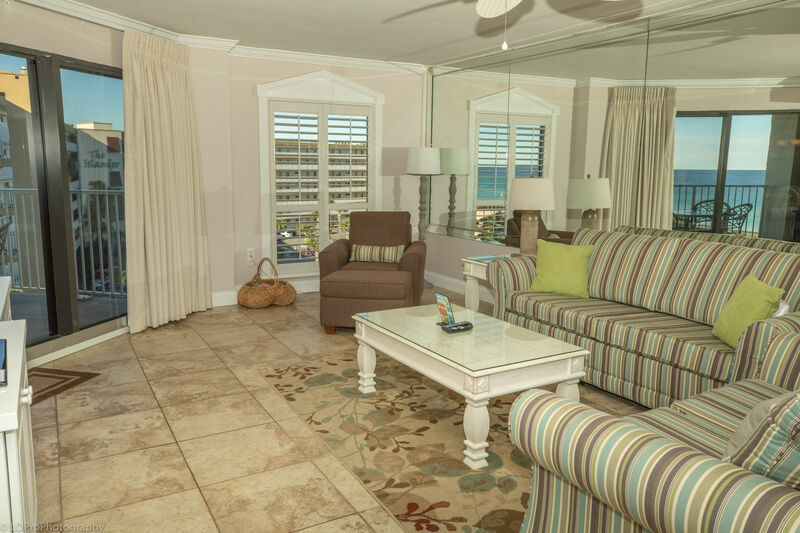 Step into paradise and gaze upon this spectacular beachside condo, Inlet Reef 516. This two bedroom, two bathroom condo sleeps seven guests in comfort and ease. The expansive kitchen has beautiful granite, and plenty of it, giving you ample counter space to prepare your favorite dish. You’ll also have all the full size appliances, pots, pans, plates and silverware you’d need to ensure your vacation is a pleasant one. Adjacent to the Kitchen is an enclosed area with a couch that doubles as a Twin Sleeper, and an HDTV. The Living Room has a big screen HDTV, a DVD player, a love seat, a couch that doubles as a Sofa Sleeper, a big plush chair with ottoman, and balcony access. The Master Bedroom has a King bed, a flat screen HDTV, a DVD player, and balcony access. The Master Bathroom has two separate vanity areas encased in granite and a walk in shower. This condo also comes with a full size washer and dryer, and complimentary high speed Wi-Fi internet access. The balcony has a wet bar built in, ample seating, an outside table, and stellar views of the Gulf of Mexico and Inlet Reef’s pool. Beautiful inside and out, this condo is a must see! Let this property be your home away from home, book now! This was definitely the perfect place to stay during our visit to Destin! Condo was clean and had all that we needed to make us feel at home. Thank you! Until next time..